Dentist - Do you need a dental crown? Find a dentist who uses 3D technology! Do you need a dental crown? Find a dentist who uses 3D technology! Have you been told it may take three-to-five visits to complete the entire dental crown process? Not sure how you’re going to schedule all the visits over the next few months? There’s an alternative, and it’s called 3D Dentistry. 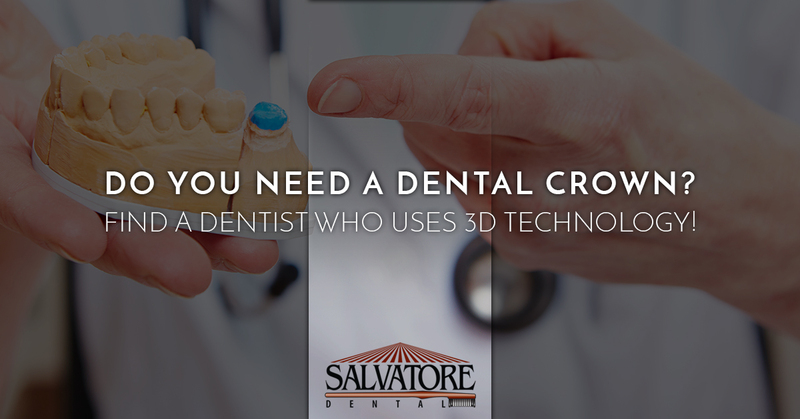 At Salvatore Dental in Malta, we use 3D technology to take images, x-rays, and impressions. We also use CEREC technology to create the perfect same day crown for your case. If you’re looking for an alternative to multiple dental care visits, give our practice a call, and if you’re still curious about how it all works, continue reading. How are same day crowns made? The entire process happens in three main steps: Impressions, X-rays, and Placement. The impressions are taken digitally, which allows for extreme accuracy when fitting your crown. Digital impressions allow for the crown process to take hours, not weeks. You’re more comfortable throughout the process, because you won’t have to live with a temporary or visit the dentist more than once to complete the procedure. Once the impressions are completed, your crown will be created with our in-office 3D mill machine. This wonderful piece of technology allows our digital images to be used to create a virtually perfect fitting crown. While your same day crown is being created, we will take X-rays of your mouth. Since we have more time to use in your one visit, we will ensure the health and integrity of your mouth before we actually place the crown. We use the best X-ray technology with the lowest amount of radiation possible. Finally, we will place your crown. We use 3D technology to reduce procedure time, perfectly place the crown, and keep all steps of the dental crown process in-house, which reduces the cost to us and making the procedure more affordable for you. What are same day crowns made out of? We use high-quality porcelain for our crowns. Our crowns are metal free, and with the use of 3D dental technology we can create better crowns faster, so you only have to visit our office once to place your crown. Once we get a scan of the patient’s mouth, we design and craft the crown on the screen in the operatory, so the patient can engage and interact with the entire process. What are the benefits of 3D Dentistry? Schedule with Salvatore Dental Today! As the only practice in the Capital district with 3D technology, we offer same day crowns and 3D scanning to shorten your dental office visit while enhancing the final result of your procedure. If you’re in need of a dental crown, give Salvatore Dental in Malta a call. We would love to schedule your appointment and get you the treatment you need!